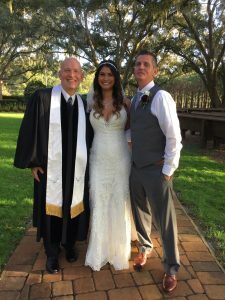 Saturday, December 8th was a beautiful outdoor wedding at Club Lake Plantation in Apopka, Florida. The temperature was perfect in the late afternoon as Natasha Joseph and James Apthorp were united in marriage. The setting was truly picturesque with beautiful flowers provided by Angie Desormeaux of Flowers by Angie and Company. A lovely cake by Lucy Ayerbe, of Sofelle Cake Artistry, adorned the reception hall. Corner House Photography captured every beautiful moment from the day for the couple to relive. Jeff Thompson of Sensational Ceremonieshelped the couple craft their unique, custom ceremony with the perfect blend of humor and touching moments. Cliff Bell of DJ CRB Entertainment provided a flawless sound experience both for the wedding and as the guests danced the evening away. Fantastic food opportunities abounded throughout the evening from the cocktail hour to the beautiful sit-down dinner, all accomplished by Alycia Burke ofCocktails Catering. Brooke Harvill of Runway Events did a super job of keeping everyone organized and managing all the intricate details of the day.